Marsh, James H.. "Bluenose". The Canadian Encyclopedia, 16 April 2019, Historica Canada. https://www.thecanadianencyclopedia.ca/en/article/bluenose. Accessed 20 April 2019. The most famous ship in Canadian history, the Bluenose was both a fishing and racing vessel in the 1920s and 1930s. The Nova Scotia schooner achieved immortality when its image was engraved onto the Canadian dime. The Bluenose was launched at Lunenburg, Nova Scotia in 1921. It was named with the common nickname – first used by T.C. Haliburton – applied to those born in Nova Scotia. The schooner was designed by William J. Roue to fish for cod on the Grand Banks off Newfoundland, at a time when such work was done from the decks of wooden tall-ships powered by sail. The Bluenose was also designed to race on the open ocean. It was the first time the self-taught Roue had designed a working fishing schooner, rather than a recreational or racing vessel. Speed was essential to both of the Bluenose’s tasks. Obviously, the faster boat wins the race, but the faster fishing vessel also gets back to port quickest, guaranteeing its crew will get the best price for its catch. Victor Cavendish, the governor general of Canada, travelled to Lunenburg to drive the golden spike that would mark the ship’s completion. He swung the big iron hammer at the spike, but failed to connect – he’d just been to another function and evidently enjoyed a bit too much drink. Someone else helped him out, and the spike was finally driven. Skippered by Captain Angus J. Walters against the fastest American schooners, many of them from Gloucester, Massachusetts, the Bluenose crew set its sights on winning the International Fishermen’s Race. The event pitted working fishermen in their regular schooners, competing for the Fishermen’s Trophy. Captain Angus Walters with the International Fisherman's Trophy (photo by W.R. MacAskill). The Bluenose achieved that goal, and more. It won the Trophy – emblematic of the sailing championship of the fishing fleets of the northwest Atlantic – in 1921, 1922 and 1923. 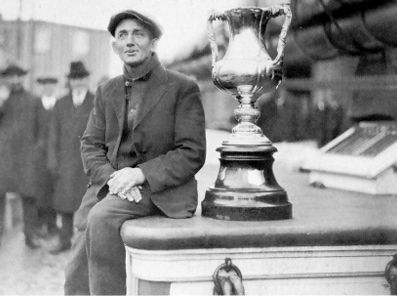 Its only defeat was by the Boston schooner Gertrude L. Thebaud in the Lipton Cup in 1930, but it outraced the Thebaud for the Fisherman's Trophy in 1931 and 1938. The Bluenose also held the record for the largest catch of fish brought into Lunenburg. Nicknamed the "Queen of the North Atlantic," the Bluenose represented Nova Scotia around the world. 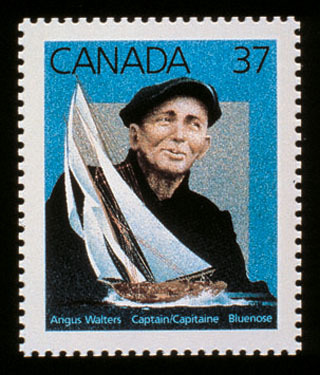 It appeared at the Chicago World Fair in 1933 and crossed the Atlantic to England in 1935 to attend the silver jubilee of King George V.
Depiction of the Bluenose on a 37-cent stamp, released for circulation on 18 November 1988 (courtesy Canada Post Corporation). In 1937, artist Emanuel Hahn’s sculptured profile of the Bluenose was stamped on the Canadian dime, and the ship still decorates the coin today. Decades later, in 1978, the Bluenose would be further immortalized in a song of the same name, by folk music legend Stan Rogers. Despite its international fame, the Bluenose came to an ignominious end. As the salt fishery declined, and sailing schooners were replaced by engine-powered ships on the Grand Banks, the Bluenose was sold in 1942 to the West Indies Trading Company. Captain Walters, the ship's last Nova Scotian owner, stood at the waterfront in Lunenburg and wept as the Bluenose sailed away for the last time. In the Caribbean, the Bluenose carried rum, sugar, bananas and war supplies to the United States. The ship had a close call while running aviation fuel and dynamite near Havana, Cuba, when a German U-boat surfaced right beside it. The submarine captain asked the Bluenose captain what he was doing – he answered that he was fishing. According to one account, the German recognized the Bluenose and let it sail off. In 1946, while hauling freight near Haiti, the Bluenose hit a reef and sank. Twenty years after the original Bluenose sank, people in her home port of Lunenburg decided to build a replica of the great schooner. The Oland Brewery paid for the project and used the ship to advertise its beer. The Bluenose II was built in the same Smith and Rhuland shipyards in Lunenburg as the original, and was launched in 1963 amid nostalgia for the lost golden age of sail. The builders used Roue’s original plans, with some minor alterations. Captain Walters sailed on the maiden voyage. The Bluenose II at its berth in Halifax Harbour (photo by James H. Marsh). In 1971, the Bluenose II was given as a gift to the province of Nova Scotia. It began its life as Nova Scotia’s sailing ambassador, based in Lunenburg, but regularly travelling to represent the province, and carrying tourists on day cruises. 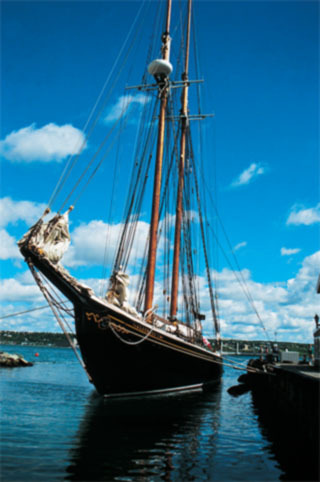 In 2009, the Nova Scotia government decided to restore the aging, 50-year-old Bluenose II. The ship was suffering badly from "hogging" – which happens when the hull becomes distorted due to the the up-pressing water and the downward pull of gravity. In 2010, many were surprised to learn that the project appeared to be less a restoration than a complete re-build of virtually a new ship. Almost the entire Bluenose II schooner had been put through a wood chipper and dumped in a landfill. The only preserved parts were the rudder, the boom and part of the prow. The Lunenburg Shipyard Alliance, the group handling the work, said it still qualified as a rebuild, and not an entirely new boat. After lengthy delays, the rebuilt Bluenose II was launched into Lunenburg harbour in the spring of 2015. The work was years later, and several million dollars over budget. The province's sailing ambassador – a reminder of the original icon – resumed regular duties in June 2015. Canada Vignettes - Bluenose 1921-1946Watch a brief video about the legendary Canadian schooner Bluenose. From the National Film Board on YouTube.